Your carpets can have a pretty big impact on the air quality in your home, your allergies (if you have them), and even your overall health. If you don’t clean them often enough, the fibers in your carpets can trap allergens and bacteria which, over time, can weaken your immune system and cause you to get sick more often. Not only that, but dirty carpets can make your home look older and more dingy — and no one wants that! At the same time, however, steam cleaning your carpets on a daily basis isn’t exactly feasible. 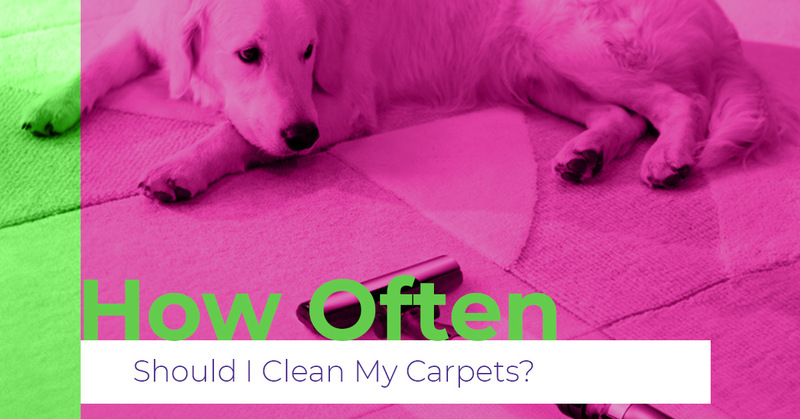 So how often should you clean your carpets? First things first, a clarification. Vacuuming does not count as cleaning your carpets. A vacuum will suction up a lot of the dirt and debris that gets caught in the fibers of your carpet, but it doesn’t actually clean them. Your vacuum is there to help keep your carpets in good shape and pick up as many small particles as possible. This can go a long way toward keeping your carpets looking good and helping to improve the air quality in your home. However, vacuums miss a lot. If the brushes are gummed up with hair or string, they aren’t going to be able to dig as deep into the fibers and loosen dirt. Or, if there is any sort of problem with the hoses or bag/canister, your vacuum won’t have as much suction power as it should, which means it will leave behind a lot of debris. Even moving too quickly as you go over your carpets could result in missing more dirt than you vacuum up. When we talk about carpet cleaning, we’re referring specifically to the sort of cleaning that involves carpet cleaners and steam cleaning. Proper carpet cleaning uses carpet-specific cleaning solutions and equipment to loosen ground-in dirt, break up stains, and get rid of bacteria or allergens that are lurking in your carpets. Do you wait until you have a noticeable stain that you can’t get out with household cleaners? Please, clean your carpets more often than that! At the very least, all homeowners should be cleaning your carpets every year or two because most carpet warranties require that much to keep the warranty valid. Of course, if you want to actually keep your carpets clean, you may want to look into professional carpet cleaning services more frequently than that. The frequency you choose, however, will depend on a few different variables. If you or someone in the household has allergies, it’s a good idea to have your carpets cleaned every four to six months. If you have a pet, specifically a dog that spends time outside, you should get carpet cleaning even more frequently — every 6 weeks to three months. If neither pets nor allergies are a problem, you’re probably safe to keep your carpet cleaning services to twice a year. Just remember, everything you’re tracking in between cleanings is what you’re breathing. At Steam Master Cleaning & Restoration here in San Antonio, we have the experience and the equipment to make sure your carpets are cleaned properly. Give us a call to schedule your next carpet cleaning services today!